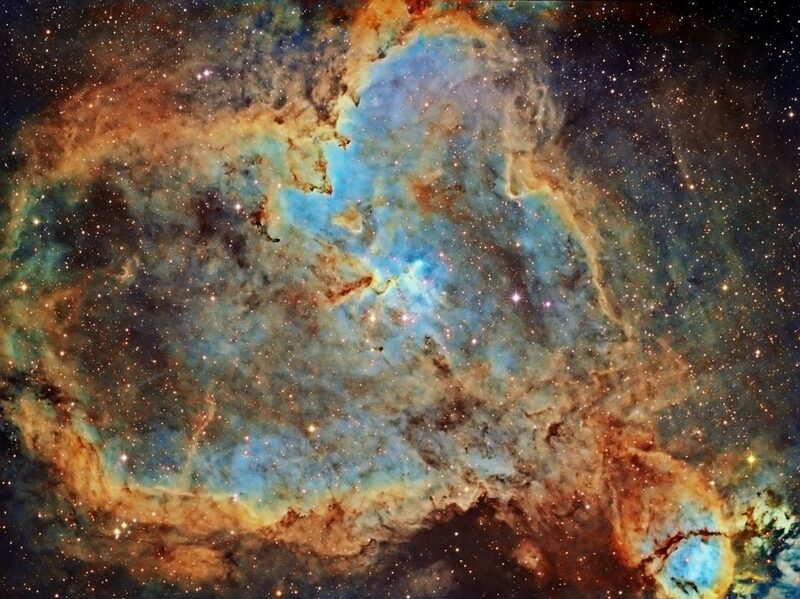 It was noted that the Heart Nebula appears in the constellation Cassiopeia, a name which immediately rung a bell as it recurs in the thought streams of the two main characters in Ulysses: "delta of Cassiopeia." While that phrase has occasionally echoed in the back of my mind the last few years, I never took the liberty to find out what exactly it means and why it pops up a few times in Ulysses. I frequently find that, when dealing with the art of James Joyce, there's always a reason for the recurrent phrases. They always mean something if not multiple things. Every microcosmic grain, when closely examined, tends to open up a new world. So, let's take a look at that melodiously named constellation "Cassiopeia" as it occurs in Ulysses and see what it all means. On November 11th, 1572 (when William Shakespeare was 8 years old), a new star suddenly appeared in the night sky just above the constellation Cassiopeia. This would be one of the most imporant events in the history of astronomy as it changed the prevailing views of the universe. While this bright new star was noticed with amazement by astronomers and sky-watchers throughout the world, credit for its discovery was given to Danish astronomer Tycho Brahe (1564-1601). This new star was dubbed "Tycho's Star" based on a book of observations and analysis he published immediately afterward entitled "Concerning the Star, new and never before seen in the life or memory of anyone." But it wasn't a new star, it was a supernova (in other words, an old star that had exploded), one of only 8 supernova events witnessed in recorded history. The supernova brightened rapidly until it outshone all the other stars and planets in the night sky and was even visible to the naked eye in the daytime. Imagine that. This is what's going through Stephen's mind in these two quotes. The exceedingly bright supernova remained totally visible to the naked eye (in the daytime!) for about 16 months and caused "considerable imaginative excitement in Elizabethan England" where it was seen "as a sort of Star of Bethlehem, heralding a new birth, the second coming of Christ" (quoting from Don Gifford's Ulysses Annotated). This was all going on while William Shakespeare was between the ages of 8 and 10, so Joyce is making an astrological connection between this unprecedented stellar explosion and the growth of young Shakespeare. As William York Tindall explains, Joyce is also linking himself with Shakespeare (as he is prone to do). 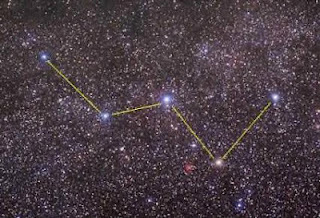 The constellation Cassiopeia is a simple "W" shape which is, as Stephen says, "the signature of his [William's] initial among the stars." But he describes it as "the recumbent constellation" which implies that "W" shape is actually lying down. In that case, if the recumbent "W" were standing up it would look like the Greek letter Σ known as Sigma which represents the "S" sound. Much later on in the book, in the purposely dry and humorously overscientific chapter "Ithaca" (which is meant to zoom out into the deepest reaches of space to view the two main characters as astronomical objects), we get two more mentions of Cassiopeia, this time by the other character Bloom. Two things of note here. First, he's wrong about what the star actually was (it was a supernova, not a collision between two suns). Second, he's pondering the exact same Shakespeare/stellar fact that Stephen made note of earlier. The first fact is just a little Joycean joke, frequently the characters get facts wrong in their inner monologues throughout the book (such as the idea that the supernova appeared at Shakespeare's birth instead of when he was 8 years old). The second fact is one of my favorite things about this book. To close here, I'm going to make an assertion in a roundabout and most likely confusing fashion. In this final instance of "Cassiopeia" I think Joyce is linking Bloom-Stephen-Shakespeare all together. This link is one of the underlying currents in the book. Earlier I explained how Stephen connects himself with Shakespeare, seeing the "W" shaped constellation as a recumbent "S". In the earlier Bloom quote, Bloom also identifies Cassiopeia as "recumbent" and here he's clearly linking himself with the Cassiopeia supernova that (in the collective mind of Ulysses at least) coincided with the birth of Shakespeare. One of the main themes of Ulysses is the idea of consubstantiality of father and son; hence Bloom (the father figure whose son died as a baby) and Stephen (the lost 22-year-old whose dad is a drunken mess) coming together quite randomly is the epiphany of the book. And in that aforementioned chapter where Stephen explains his strange Shakespeare theory, he is arguing that Hamlet is actually representing Shakespeare himself as is Hamlet's father (it's often argued that Hamlet is influenced by Shakespeare's son Hamnet who died at age 11). Thus, Hamlet's father = Hamlet = Shakespeare which is equivalent to the situation in Ulysses where Bloom = Stephen = Joyce. Who ever said this stuff was complicated? I am one of the recent Volunteers who are keeping the Joyce Tower in Sandycove. Co. Dublin (Setting for the first page of Ulysses) open to the public, Free of Charge. As a result, I am trying to brush up on my knowledge of Joyce. I find your blog very interesting and helpful in doing this. Can you comment on the two different spellings of what is apparently the same word hereunder. I had assumed it was a simple "TYPO" but with Joyce one never knows. "beyond the fixed stars and variable suns and telescopic planets ... to the extreme boundary of space" until "somehow reluctantly, suncompelled" he would return (how great a word is "sumcompelled" in this instance?). Thanks very much for your comment, Patrick, that's really an honor to hear! What you've noted there was just a simple typo which I've just corrected. It's funny, though, because that kind of little typo occurs in Ulysses where Bloom's penpal mistress writes in a letter "other world" instead of "other word" and it becomes something he ponders throughout the day. That last line is shortened in the somewhat famous version of the quote that's always attributed to Joyce: "mistakes are the portals of discovery." Portals of discovery such as word/world and sum/sun are blasting open all over the pages of his final and arguably finest work, Finnegans Wake.